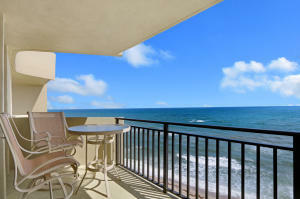 5460 N Ocean Drive #8-b Singer Island, Fl 33404 has been sold. You can view available homes in Seagrape. DIRECT SOUTHEAST CORNER OCEANFRONT WITH OCEAN, BEACH AND INTRACOASTAL WATERWAY VIEWS. THIS UPGRADED SPACIOUS TWO BEDROOM TWO BATH CONDO OFFERS LARGE TILE FLOORS IN LIVING AREA, OPENED KITCHEN WITH WOOD CABINETS AND CORIAN COUNTER TOPS, NEWER BATHROOM VANITIES AND ALL HURRICANE IMPACT GLASS SLIDING DOORS. BRAND NEW DISHWASHER AND REFRIGERATOR (2017). BOTH BEDROOMS WERE DESIGNED WITH PRIVATE TERRACES AND SLIDING SHOJI DOORS THAT OPEN TO THE GREAT ROOM THAT FEATURES A LARGE WRAP-AROUND OCEAN FRONT BALCONY. UNIT IS WIRED WITH BOSE SURROUND SOUND SPEAKERS. BEING SOLD NICELY FURNISHED AND INCLUDES ASSIGNED GARAGE PARKING. A.C. REPLACED IN 2016. 5460 N Ocean Drive #8-b located in Singer Island, FL is a condo with 2 bedrooms, 2 full baths and 0 half baths.The Condo at 5460 N Ocean Drive #8-b was built in 1973 in Seagrape and offers a 1 car garage. This Seagrape Condo offers pool, tennis, elevator, lobby, exercise room, extra storage, common laundry, community room, spa-hot tub, trash chute, manager on site, putting green. 5460 N Ocean Drive #8-b Singer Island, Fl is currently listed for $465,000 under the MLS# RX-10372629. This Condo has been put on the Singer Island MLS system and currently has a status of SLD. Information in regards to Singer Island real estate and Seagrape Condos for sale or any other areas may have come from a cooperative data exchange service. All rights reserved. Information deemed to be reliable but not guaranteed. The data relating to real estate for sale on this website comes in part from the IDX Program of the Florida Regional MLS. Listing broker has attempted to offer accurate data, but buyers are advised to confirm all items. We provide all information about Singer Island Condos for sale and Seagrape real estate and all other site listings as is with absolutely no warranties. This site will be monitored for 'scraping' and any use of search facilities of data on the site other than by a consumer looking to purchase real estate, is prohibited. Feel free to contact our agents to find a great Seagrape Singer Island specialist. Seagrape offers really great Singer Island homes for sale. However if you don't find exactly what you want and you want to look throughout the local Palm Beach county real estate market, please visit Palm Beach Real Estate or Florida Homes.